Update (July 24, 2016) - Fixed the instructions for the arm/leg section. The old version included a purl ridge that isn’t needed. 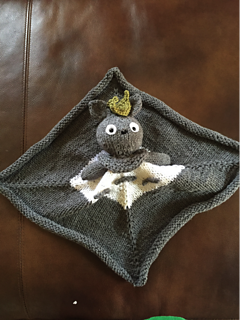 Update 2 (July 25, 2016)- Thanks to Victoria4515; added instructions for blanket cast on and fixed color change (white to grey) instructions. 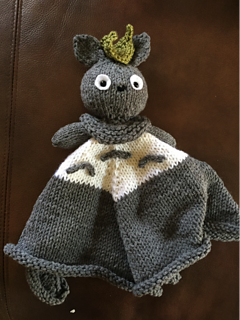 This is a knit “lovey blanket” depicting My Neighbor Totoro. I adapted it from several patterns (listed above). Please let me know if you find any errata. Note - I let the edges of the blanket curl; if you don’t want the curl, finish the bottom 8 rows of the blanket in garter stitch. • Safety pins to help with assembly.